This photo of my great-grandparent’s pond was taken sometime in the late 1950s by my father. 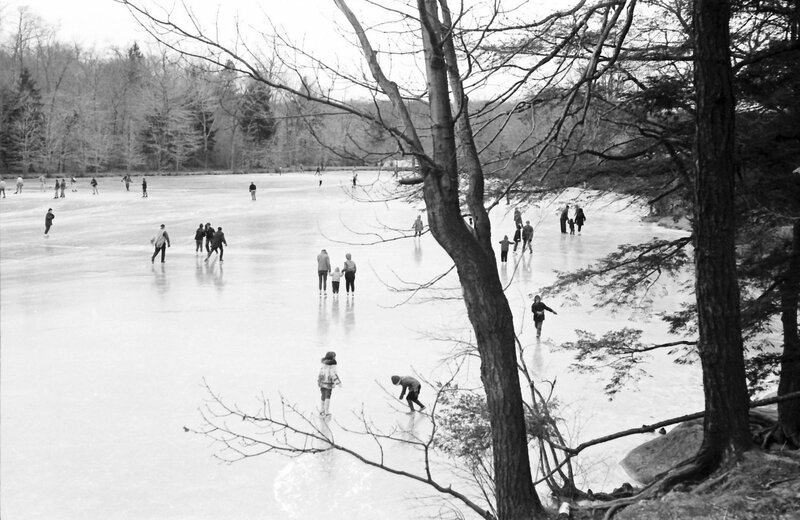 In New England, it used to be that seemingly everyone went skating on ponds almost all winter long. My great grandparent’s house had salt water on the south side and fresh water on the north. While more of summer was spent on the ocean side, every winter, once the ice was completely frozen, the skating on the pond would begin. My great-grandfather had even built a couple of contraptions, taking two old sleds and adding some sides and handles, so those too young to skate could be pushed around the ice by those who were older. There was always a vigorous and continuous hockey game over on the far side. They had their territory staked out and no one dared to cross it, and not just because of the flying pucks. This was serious business, and to me, mysterious business. I kept my distance. It was a time when there weren’t really any grown-ups in charge, but there were always grown-ups around. From my vantage, things just got done. Any new snow was quickly removed. There was always a fire going on the hockey side, built in a concave section of the rocks. At night, from the room in which I would sleep, all I could see was the fire but I could hear clearly the sounds of the hockey sticks hitting the pucks and the “spirited” voices of the players as I went to sleep. All of the nearby houses - most of which belonged to family members - had skates, in varying sizes, in their entryways and closets. Each year we would rifle through and find the size that fit that season. Once everyone in the family had grown out of the smallest sizes, the skates were passed on to cousins and second cousins. Ice continues to change how we use the topography. These days, there seems to be more people driving on ice than skating. A friend in Machias told me that the fastest way to drive to a favorite store was over the ice. My mother-in-law keeps us updated on the activities around the bob houses in front of the cottage on Winnipesaukee. But it is still not uncommon in so many villages to have a neighbor knock on the door and ask, "Can we skate on your pond?" We skated on the pond next door from the moment we could first stand on skates with Dad holding our hands! By age 8 I was trying to mimic Peggy Fleming's moves, with probably laughable (but gratifying to a kid!) results. Later, I strayed over to The Hockey Side as the first girl who waded in there to play--and the boys let me stay! A younger girl I taught to join us later went on to play for UCONN's first women's team which I've always been very proud of. The pond would freeze sometimes by Thanksgiving Day in the 60's; now, it seems like skaters only get in a few days per season. Thanks for the memories! Loved this post. I grew up skating on ponds outside of Boston. Playing pond hockey is nirvana - time with friends, good competition, outside exercise, clean fun, and relatively cheap (skates and a stick). I remember my mother would make hot chocolate and ritz crackers with peanut butter. She had a pair of speed skates and would glide around the pond. The ponds don't freeze like they use to. Miss it a lot. In Holland you know it's a good winter because slowly, slowly the excitement as first the cannals freeze over, students at the end of the evening bike on the ice and little kids get up early to shuffle to school. Then The large expanses of water in the north start the freeze and you hear news of the elfstedentocht. Every news programme starts and ends with a man staring at a bridge asking another man whether the ice is thick enough yet. The moment he says yes the country moves into action. It hasn't happened since 1997, I think it's time. A couple of years ago the pond in front of the parliament (hofvijver) froze over and we went skating between classes, eventually ending in an impromptu faculty vs student hockey game. I'll cherish the unplanned memories the most. When I look outside and wonder wether I should risk my neck by biking to the faculty I remember the great things that winter brings as well as the bruises and freezing fingertips. My grandmother maintained that when she was a child, one could ice skate across the Thames River from Groton to New London. We have viewed this claim with some skepticism, though this would have been well prior to the river being dredged to allow the ingress and egress of submarines. Longfellow's Pond in Wellesley! We would walk there after school and the only rule was that we had to be home before dusk.I wore a skating skirt, tights, and a very thick woolen skating sweater no matter how cold it was. We seemed impervious to the cold. And later, during college, I had a boyfriend whose parents belonged to the Dedham Country and Polo Club. That wonderful little pond had a warming hut and we drank hot chocolate. Marvelous times! This evocative photo reminds me of my favorite painting, The Hunters in the Snow by Pieter Brueghel the Elder, showing the Dutch skating and playing hockey in the 16th century. My first recollection of skating was on a small pond built by our neighbor, who had played hockey at Harvard. I can still see him skating at lightening speed as evening would fade into darkness. He and I were always the last to leave and I was always the first volunteer to grab a shovel when it snowed. One day, when I was about twelve, my father and I drove downtown on some errand. On the way home, he spotted skaters on Manchester Harbor, a rare sight as salt water doesn’t freeze easily. But we had had several weeks of frigid temperatures with little or no wind. My father exceeded the speed limit to get home so we could grab our skates. For the next few hours, we glided over ice as smooth as glass, and in the exact part of the harbor where our boat had been moored the previous summer. It was a joyous afternoon. Years later, when I lived in Vermont, I rarely left the house without my Tacks tucked down by the heater, just in case. I first put my son on ice when he was one, holding him between my legs at the Dartmouth rink, letting his little feet touch the surface, his eyes big as saucers. As he grew older, we skated together on black pond ice whenever it was available, often in the moonlight, often at temperatures well below zero. For us, skating is nearly primeval. What's the name of that "race" on canals -- if canals are frozen? Thousands skate hundreds of kilometers -- town to town? Over a series of days? Is it still a custom? Is it too warm? I'd love to go visit to do it unless that is just my imagination. I love the notion of falling asleep to the sound of hockey sticks hitting pucks, and the idea that there's a warming fire out there in a dark night. It's magical somehow, and soothing, too. Here in the Upper Great Lakes (Wisconsin), skating rinks used to be along the river, in low lying, sheltered places or in spots where islands nearly touch the "mainland." Now they are usually in parks. Using cars or snowmobiles over the ice is often a risky venture, and sometimes results in tragedy. But there was a time when buildings were pushed across the ice to Door County. The beautiful Whistling Swan Inn of Fish Creek was once a railroad hotel on this side of the bay. Dinosaur Pond in Bloomfield Hills! So named as it was rumored that dinosaur bones were found nearby; about 30 years ago I made a trip over to the pond for a skate. It was professionally cleared off by someone's dad, ready for hockey and free skating. I liked it better when we cleaned it with snow shovels and brooms - plus, I got cold much quicker than when I was a kid!!! Muffy, so many of your posts tug at the heartstrings. @ David Sucher, it is the Elfstedentocht that you are thinking of. My mother would tell us about it every winter when the ice froze. When I was in middle & high school we lived across from a pond, and when it was frozen, after school, my sister, best friend and I would swap our backpacks for skates and skate until dark, imagining that we were in the Elfstedentocht and mimicking the long, strong strokes that my mother used when she skated. As for many here, this splendid post conjures up long forgotten but happy memories. My cousins and I would walk through the neighboring orchards to a local farm pond and skate until dusk or until our toes were frozen. No one ever worried about us, and we were a good quarter mile from home, though neighbors would keep an eye out no doubt. Then it was home to warm my toes under the radiator or under my darling dog's tummy while my Mom made cocoa. This was before helicopter parents and before all the worries that limit outdoor fun for kids today. I absolutely love this story Muffy! It is a dream of mine to take my kids skating on a pond and to play pond hockey. Your memories of bonfires and "spirited" voices created wondrous imagery for me. I could almost feel the cold of the glass in the windowpane, and instantly longed to open it to feel the rush of frozen nighttime air. There is a wonderful documentary film entitled "Pond Hockey" that explores similar fond memories of ice hockey players, especially the central role the local pond played in their early development as well as their memories of childhood, family and home. Thanks again Muffy, and Happy Holidays to you and yours! Great photo that brings back so many memories. I'm surprised that no one has mentioned the "roar" that the ice makes when it starts to crack underneath--and sends everyone scrambling to the shore! Nicely timed as the weather here has turned decisively colder. Growing up, we skated on small frozen ponds. We usually got a new pair of skates for Christmas, which we relished. Our favorite pond was about a mile through the woods. Everyone walked along the trail laughing and having a good time. No one ever drove. At the pond, grown ups tended a fire and had hot chocolate for us kids. Sweet memories. For a year or two, the town's fire trucks flooded the local school yard which had a bowl-like depression. It got very muddy in the spring and ruined the ball field, so that practice stopped quickly. I guess they decided natural ponds were better. When I got older, we went to the Supply Pond (Branford) for skating. it seemed like everyone in town was there, though I was mostly focused on my girl friend at the time and showing off my "skating moves" to try to win her attention. Sometimes, we would venture to Lidyhites Pond, but that was always pretty windy and fewer people skated there. When I was a Boy Scout, our troop would have an annual winter camp out at Chatfield Hollow in Killingworth. The park was usually packed in summer, but no one was there during the winter. The pond was frozen and the scout leaders had a bonfire near the shore and set up a few flood lights over the pond. For 15 or so boys having a pond lighted up at night all to ourselves was a special treat. Occasional reader here, happy to have chosen this morning to stop by. Love the photographs of your gp's skating pond. I grew up a Midwest 'rink rat' and always enjoyed the chance to skate outdoors -though it wasn't too often with our frigid Chicago temps! As a kid in Greenwich, CT I remember rifling through my grandparent's basement and finding an old magazine from the 60s that contained an article about my grandfather attaching a parachute to himself and being pulled across a pond on ice skates, ha ha! How cool. Also, yes, we had a pond in the backyard and skated on it most winters. Ice skating is something I miss since moving to New Orleans, where the nearest rink is quite a ways away in Baton Rouge. I, too, have fond memories of skating on my parents' pond. Always nervous when my Dad would test the ice...my dad would just laugh! We'd bring the lantern out at night and enjoy some evening skating as well. I do indeed remember those great booming sounds the ice made as it cracked and expanded; all night long in below-zero weather in fact. It's been many years now since the pond froze hard enough for that to happen. Only the "coolest" kids could stand their ground acting unconcerned as the ice split beneath their feet! Then we would get down on all fours to see how deep the crack ran, it was the only way to know the true thickness of the ice. In the coldest winters it was often a foot thick or more. In fact, the 1800's they harvested ice from that and other ponds nearby commercially. If the ice froze really quickly and it neither thawed nor snowed, we would get a few days of the coveted "Black Ice," clear as glass and through which we could watch the pond's population of giant orange carp going about their business, quite unconcerned with the skaters, the shouts and the flying hockey pucks. While in many ways I'm grateful that the tail end of the "Little Ice Age" is past, making winter life with a barnful of horses a bit less physically challenging, I definitely miss those days when "Winter," too, was a verb! There is still pond skating in the small New Hampshire village where I live. It's wonderful. We've always skated and played pond hockey in the Upper Valley (the area of VT/NH near Dartmouth) and in particular on Occom Pond in Hanover. We would also sled on the Hanover Country Club right next to the pond. There is no better feeling in the world than pond hockey, besides skiing. Back in the 1970s, when it still got cold enough to freeze, we would not only skate but there was also a large contingent of ice boaters on the Shrewsbury River in NJ. My dad had an Arrow class ice boat. I can't remember ever being so cold as when we would whip around on the ice in the ice boat. It was also exhilarating. Yes, indeed! We skated on several ponds (in Barrington, RI) when I was a little boy in the early 1970s. Muffy will no doubt recall that that was the era of Orr and Esposito, when all the little New England boys were sure that hockey was the Very Best Thing Ever. There are more indoor rinks now, and hockey seems to have since become one of those over-structured Things where the kids are micromanaged by professionals with clipboards and excessively caffeinated parents, but kids (and adults) do still skate on ponds in these parts. What a nice memory. Pond skating is such a fascinating and foreign concept to me (and a little scary). My grandfather-in-law apparently used to ice skate across the town harbor to go to church but the regularity of that may be a little exaggerated. Now the local fathers build an ice rink over the tennis courts and even that doesn't freeze very consistently some winters. At 50, I just purchased a pair of new skate laces to go on my hockey skates. Ready for the season. . . The BEST outdoor skating I ever did was on a bright, sunny, high-teens day, on a cornfield that had been flooded by the river and frozen---acres of absolutely perfect hard ice, enough for a half dozen skating rinks, perhaps 10, and a puck and stick to knock around with. I feel REALLY BAD that contemporary mores and etiquette is against this kind of enormously fun outdoor behavior. Much more "appropriate" and "child psychology PC" to have the kid sit on the couch. One day at boarding school in Canada we heard the ice was clear on Rice Lake and we went for a skate. The breeze was up and we opened our jackets and glided along, stopping once in a while to look at fish frozen in ice. We got so far down the lake that a jeep had to be sent out with a rope attached to it, to haul us back to the bus. Later, at Holderness School in New Hampshire, where my father taught, he and two other teachers would go out late in the night to build ice on the makeshift rink. And still later, in Maine, on the Belgrade Lakes, I remember a cold night with the moon high, skating with friends, while all around us the ice cracking sounded like rifle shots. Thanks for the picture! I too grew up skating on a country pond with family & friends. If we could only go back, it was magic. Thank you for this post ..
At Middlebury College (where even today it can still get (and stay near and sub zero for weeks) one field near the student center, across from the chapel is flooded during the winter for skating and some hockey and broom ball. What is the size demarcation between a pond and a lake? I came across a family lake of 23 acres or so which is named as a lake and my mother said, no, that is a pond. That the bodies of water in Lakeville are what new Englanders call lakes. Something the size of Winnipesaukie. I drove past a pond in Durham, CT, after moving to New England several years ago. The entire town, it seemed, was out there skating. I loved it. For those old enough to remember, this day fifty years ago stripped away much of our innocence. It seems to have been eroding ever since. The vitriol for President Kennedy present in Dallas back then is echoed in today’s ugly political discourse. It’s no longer safe to let kids out of your sight, even for a split second. When once we knew and recognized everybody in town from a distance, the constant motion of society can create towns populated by relative strangers, unless you’re lucky enough to be living in a small village. Recently, I reread my Vermont great-grandfather’s journal for the twelve months leading up to the Battle of Gettysburg. Before he put on his uniform and boarded a train south, his daily entries describe constant interaction with folks in his town, and descriptions of how people helped one another as a matter of course. His journal is filled with names: the old, the young, his contemporaries and especially women, as he was single in 1862 and spent as much time as possible with every potential prospect. The point is, his journal depicts an active participation in and a strong sense of community. One reason I’m drawn to The Daily Prep is that it echoes that sense of community. It may be virtual, but TDP is one of those rare places on the Internet with substance. The photo that accompanies this particular post, along with Muffy’s commentary, tells a deeper story, evidenced by how we’ve all reacted to it. It’s shows community the way we remember it, and in a way that helps keep innocence alive, which is not such a bad thing. MGC, your comments are beautifully written and echo my sentiments. I remember eagerly awaiting the first deep freeze and skating on the local pond. Hot chocolate in a thermos and giggles with friends as the local boys played hockey. My three children all played hockey, but only occasionally had the chance to skate on a pond at some of the local clubs. I remember my one son being amazed that people skated outdoors-up to that point he was only familiar with indoor rinks and there funky smells. My parents both remembered skating across the Hudson River in the 30's. Bring on the cold!! I know I speak for all of your readers when I say that I am thrilled to learn that an earlier report of your demise was an exaggeration. Regarding Casey's comment: My husband grew up in Durham,Conn. in a pre-revolutionary era house on Main St., and remembers learning to skate on a pond near his home. Perhaps it was the very same one.